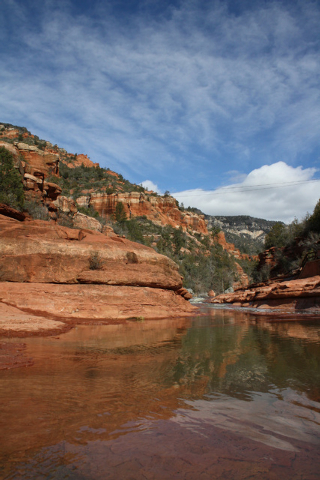 Along the Sedona-Oak Creek Scenic Road, just north of Sedona, you’ll find Slide Rock State Park, one of Arizona’s most beloved destinations. The park is well-known for the section of Oak Creek where adventurous visitors can slide down an 80-foot natural water chute within the Coconino sandstone. But it is not only the water features that draw people here as the park has great historical features you can visit and some fine hiking trails. Furthermore, it’s an activity that’s fun for children and other energetic people, which easily can be incorporated into a visit to the leisurely resort of Sedona. For that matter, it’s a great stop on any trip through northwestern Arizona. June and July are good times to visit as the temperatures are often in the low 90s — good weather for the old-time pleasure of swimming in cold water that is very clean and untainted by either chlorine or salt. Elevation here is about 4,900 feet. The property was developed and homesteaded more than 100 years ago by Frank Pendley. He planted an apple orchard and soon established an irrigation system to take advantage of the flowing water of Oak Creek. Pendley blasted, drilled and built tunnels in the sandstone cliffs and funneled water using metal flumes to water his crop. The Pendley family farmed the property until the mid-1980s and then turned it over to the Arizona Parklands Foundation, which was then turned over to the state. The park was officially opened in 1987 and is managed by the state park system and the Coconino National Forest. From the parking area visitors usually start by just strolling north on the Pendley Homestead Trail, the main access into the park. This paved trail takes you by the original apple orchards and newer semidwarf trees. You will walk by many structures including the fruit-packing barn and the bungalow-style Pendley Homestead House, which was built in 1927, an upgrade to the family’s original and more modest home. After walking about 0.3 miles from the parking area you will find the easiest place to access Oak Creek. Wide stairs help the visitor get down to the Coconino sandstone that flanks the waterway. There are many places to stretch out a blanket and settle down and either head to the water for a dip or just unwind, picnic and relax. I wouldn’t recommend the creek for children or anyone not comfortable with possibly being banged up a bit, as the water is swift and the chute can be rough on your body as well as your bathing suit. As the water flow and level can change quickly it is always best to watch a few brave souls do the chute before you head into the water to see what you might experience. You can take some hiking trails from here or even head over the drainage on the small footbridge to the east side of the creek and walk upstream. Here you will find the stone cabin, along with a water wheel and flume, which Pendley used to generate electricity for his homestead. There are a variety of birds that have been identified in the park including lazuli bunting, black-necked grosbeak, western tanager and several types of hummingbirds. The park is an extremely popular destination, so be sure to arrive when it opens to get a parking spot and a place to relax along the edge of the creek. Summer hours until Sept. 1 are 8 a.m. to 7 p.m. (no entry into the park after 6 p.m.). The entry fee in summer is $20 per vehicle (containing as many as four adults). Pets are permitted in the park but not in the swim area. There are restrooms and a small market. For more information, call 928-282-3034 or visit www.azstateparks.com.